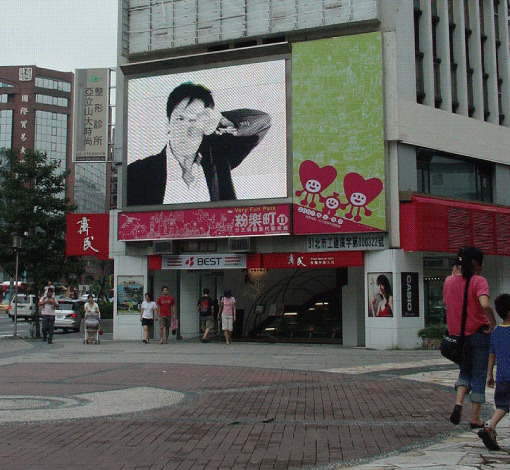 Dance | video | 2006 , Showed in 2007 “Very Fun Park II” exhibition in East Area, Taipei. 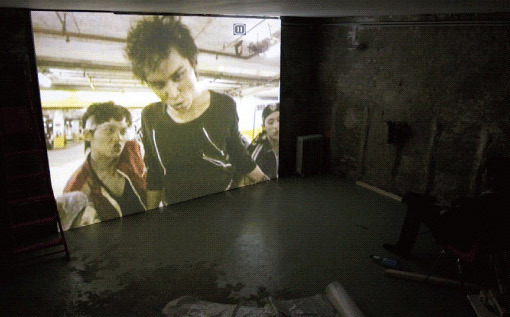 Bad | video | 2005, Showed in 2006 “Wrong(ed) Attitudes” exhibition in Sparwasser HQ, Berlin. In my opinion television is a normal part of life. In the 1980s, when I was still a child, Taiwan only had three official television stations. They would stop broadcasting at midnight and play a short national anthem film before shutting down. Half of my childhood was spent in front of the TV, and I would often see the national anthem being sung before I went to sleep. Around that time, the term “TV kid” appeared which was used to describe the spreading popularity of television among the new generation. Similar to many products of an era, the TV kid generation will soon disappear, and this time it will be superseded by the “internet generation”. When I think back to the work I made from 2004 to 2007, I realize it was actually a kind of personal testimonial; a testament to the TV kid generation, its particular way of thinking and problems and the fact that it was soon to be wiped out. These works essentially discussed the legacy of this generation. When I first started, I was very interested in everyday life and this was reflected in my work. Although the work was rather cold and too serious at this time (like Happy Space, 2002), after 2004 I started to turn towards jokes and banter to express myself. The jokes weren’t a strategy for making a statement it just happened that I started to include television-related subject matter in my work, and in my experience television was really funny (even if something is very serious, when it’s on television it looks very funny to me), and so jokes were inevitable. After 2004, my video work included a three-part series called Endless Recalling. The subject of this series was a television soap opera and “feel-good purchases” and was related to sensational tricks commonly seen on television. The pieces Bad (a 2005 collaboration with Huang Yi-ru and Wang Jia-ming), Stars and Stripes (2004) and Dance (2006) all talked about MTV culture, identity and the process of colonization. In The Super Model Love (a 2005 collaboration with Zheng Shi-jun) Zheng Shi-jun and I crashed a performance by super model Lin Chih-ling and were consequently in a news story with her. At the scene, we were warned by security guards and asked to leave. The artwork was about television and idols. Everything (2006) used moving type similar to a news headline or movie preview. From beginning to end this film was about everything in television culture, especially the impressions that news and movie previews give us. Another series was The Fabled Shoots, which was inspired by shoot-out scenes from Hollywood movies. With these works I talked about the frightful imaginings and experiences of the media generation. My everyday habits make me an out-and-out TV kid. I believe the time for the TV kid generation has already passed, since the internet will soon completely replace the experience of the television. Nowadays, many people don’t even watch TV but they can’t do without the internet. The way the internet transmits images has already created a new kind of media experience which frequently allows one person to be both the producer and user (like the very popular YouTube). This makes me think of the internet term “end user” which generally refers to an individual computer user. End users have gone from being relatively passive with no means of production, voice or participation to active creators of content. This is due to blogs, websites designed for groups or setups like YouTube. In contrast, nearly everyone of the TV generation was strictly an end user; TV kids could only receive information and could never make their own statements. According to a 1999 American Academy of Pediatrics report, children two and younger should never watch television, and children a little older should have their viewing time limited or avoid television altogether. The reason is that most television programming is devoid of content or spreads a lot of misinformation, and furthermore image information will cause a child’s ability to imagine or reason to decline. These concerns compared with today’s internet experience can only be seen as a big fuss over nothing. TV kids are already something of the past, and today’s media environment has become much more complex and varied. These works of mine are like a summary; they summarize my experience watching TV, serve as a recollection of an era, and bid farewell to the TV kid generation. Why must we “bid farewell”? This is a complicated question. As I said before, many researchers firmly believe that television is a hindrance to personal and intellectual development. Besides the warnings of those medical organizations, the French scholar Pierre Bourdien gives us another reason. He believes television presents an enormous danger to art, literature, science, philosophy, law and other forms of cultural production. According to Bourdien we should strive to expose the influence television has over our lives, and make everything clear so everyone can freely express their conscious points of view. In Bourdien’s opinion, television is a very bad and dangerous thing indeed! However, this is not necessarily the correct view, as many other researches have pointed out television’s positive contributions. Every time I watch television, I can’t avoid wondering what television—this part of my life I never had the opportunity to choose myself—really is. Is it what those published theories and medical reports say it is? Is it all those television stars that appear everyday? Does it come from that confusing world of high technology that I will never understand? Is watching television already passé? Television is inevitable yet distant in this way, and this not only encouraged me to consider its significance, but also once made me want to give it up (when I was in college, I once went a whole year without watching television). Therefore, at this time there are multiple reasons for “bidding farewell”. One reason is because of my excessive reliance on television for stimulation, another is it’s dubious intellectual value, and a third is my understanding of media in terms of history (from the standpoint of trends, television seems destined to disappear). I still watch television until I fall asleep. When I wake up, the first thing I do is turn on the television. When I eat, I usually want to watch television, and if I could, I would put a television in the bathroom. In this way I am not much different than twenty years ago; I am still a TV kid. Television has occupied an extremely important part of my life, and even so, I am now using my artwork to create a memorial to this fading era. However, in comparison, the television era seemed somewhat simpler than today.